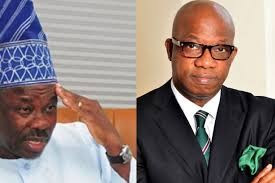 The crisis in APC Ogun state has taken a different turn as the state governor, Ibikunle Amosun who is still a member of the All Progressives Congress (APC), has vowed to work against the party's governorship candidate, Dapo Abiodun. Recall that Amosun's preferred candidate, Adekunle Abiodun, lost the party's ticket and eventually defected to the Allied People’s Movement (APM). Speaking at a stakeholders meeting of the APC in Abeokuta on Monday December 3rd, Amosun said he was aware of Akinlade's defection from APC and could not stop it because he felt the party leaders worked against Akinlade during the party primaries. Amosun stated he would support Buhari's campaign in the state but would never support the governorship candidate, Dapo Abiodun. “When these people came, they told me they are leaving the APC, I said ‘no’ but I couldn’t stop them. In fact, Akinlade has my full support. I am not going to stop him, everything I have, I will use to support him, let them try whatever they want to try, we also have our strategies and I am not going to hide behind one finger.